What honestly astounds me is just how little thought seems to be put into the analysis of such subjects by the average person. Scratch that, not the “average person”; even highly intelligent people appear to be drawn in. Wow, riveting stuff Gizmodo I guess when we see a pigeon walking on the ground we can safely conclude that it is not a bird; given that walking “doesn’t look like the motion that wings produce.” Very conclusive evidence. It seems that most of the critical appraisals of the subject aren’t actually of the subject at all. Bialy and Loeb never said it was aliens. It’s media commentators that are running wild with the note at the end of the study that this object may in fact be artificial in origin. Now, did Bialy and Loeb likely expect such a reaction, almost certainly. But that’s the nature of the beast. And if the hyperbolic nature of the news media can bring more attention to science, and especially to space, I say full steam ahead! But to say that the study is somehow refuted because “they said it was aliens and they can’t know” is a scarecrow, and is fallacious. That’s not what was said at all. We currently do not know what caused the object to speed up. But it’s more than that. Rocks don’t just magically speed up on their own. I hate to break it to you, but that’s not how rocks work. What can happen, is something called “out-gassing.” When a comet gets close to the sun, and starts to heat up, some of the ice it is composed of will melt and shoot off as a gas, pushing the comet and leaving a distinct trail in it’s wake. We didn’t find that with ‘Oumuamua. In fact, a recent paper suggests strongly (via a mathematical model) that it would not be possible for this object to be a comet propelled by out-gassing. The solution proposed by Bialy and Loeb, that the object is potentially being pushed by the sun, is more likely based on a preponderance of the evidence. Obviously, nobody knows. But there’s a lot of things we don’t know about this object. For starters, we don’t even know what shape it is, or how big it is. You may have heard people talk about how it is “cigar shaped”. Well we can’t say that for certain. That is a theory that was drafted in response to observations of ‘Oumuamua. Most specifically the magnitude of light the object reflected back at our telescopes on the ground. The point I’m getting at here is that: nobody knows what is going on with this thing. To say that is “is” aliens is just entirely baseless. But here’s what I hear most of the critical appraisals saying: “You need to stop talking about aliens because just because we can’t prove it isn’t aliens doesn’t mean it is.” That’s partially true, but off the point. You see, the point here is that we don’t really know anything about this thing. We are making inferences based on slivers of evidence, and attempting to determine what is most likely true. 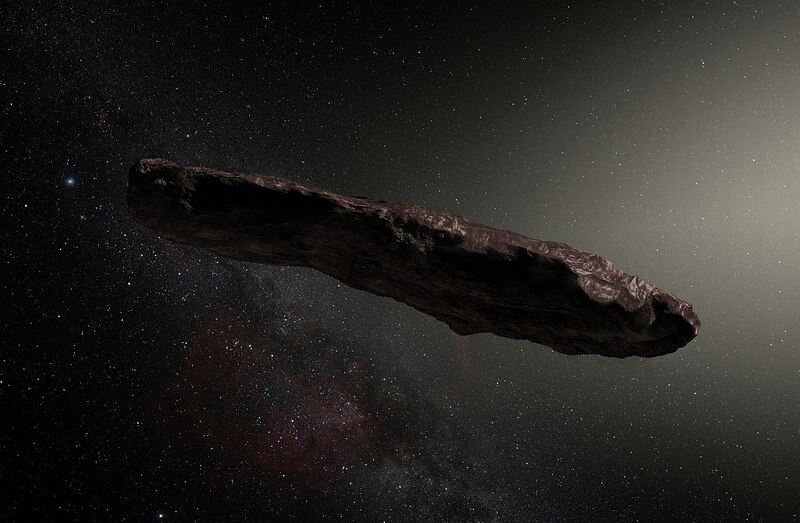 We don’t know that ‘Oumuamua is cigar shaped. That’s just the current best guess we have to work with. There is in fact a competing theory that the object is more shaped “like a pancake.” If we you’re gonna pen a self-righteous jab at attempts to challenge the current body of knowledge in the world; perhaps you should focus just as much attention this topic. Which guides me to the conclusion of this article. There is one more wheel to turn, one more peg to be driven into its hole. There does appear to be an unspoken undercurrent of logic to the acceptance of the claims as to the ‘Oumuamua’s shape, and subsequent exasperation over it’s possibility of being a solar sail. That is, that we’re very used to looking at the sky, and seeing rocks. And we’re not used at all, to seeing much else. Based on all of our understanding of the ways in which the universe works, we should not be alone in the galaxy. Not even that, but when we turn our heads to the sky, we should be looking at a bustling marketplace, not quiet, desolate, emptiness. If even a single civilization has advanced to a tech level only a few hundred years ahead of where we are now, they should be able to colonize the entire galaxy, in less than a few million years. That’s without warpdrives, without teleporters, etc. (The method for this could be what is known as a Von Neumann Probe.) And though a few million years may sound like an eternity to you and I, it is a cosmic blink of an eye. What’s the probability that in a universe filled with innumerable planets around stars massed in galaxies as far as we can see, we are the first? And that’s the point. The Fermi Paradox is so striking, because when we look at the skies; we expect to see other civilizations. That we don’t see anything, is incredibly weird. So when people say “it’s incredibly unlikely that its aliens” it’s actually not. Regardless, whatever this object is, it’s certainly something weird. Its composition, movement, acceleration, origin, they’re all like nothing we’ve ever seen before. Maybe it’s just a really special space rock, and maybe it’s not. Either way, let’s not throw out our best guesses because we want to feel smarter than others.